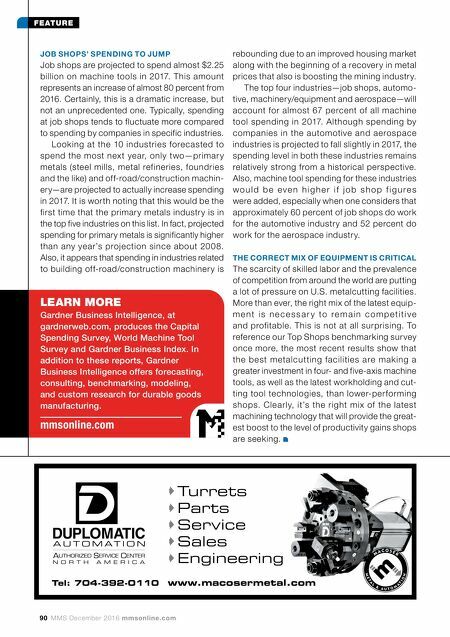 90 MMS December 2016 mmsonline.com FEATURE JOB SHOPS' SPENDING TO JUMP Job shops are projected to spend almost $2.25 billion on machine tools in 2017. This amount represents an increase of almost 80 percent from 2016. Certainly, this is a dramatic increase, but not an unprecedented one. Typically, spending at job shops tends to fluctuate more compared to spending by companies in specific industries. Looking at the 10 industries forecasted to spend the most nex t year, only two—primar y metals (steel mills, metal refineries, foundries and the like) and off-road/construction machin- ery—are projected to actually increase spending in 2017. It is worth noting that this would be the first time that the primary metals industry is in the top five industries on this list. In fact, projected spending for primary metals is significantly higher than any year's projection since about 2008. Also, it appears that spending in industries related to building off-road/construction machiner y is rebounding due to an improved housing market along with the beginning of a recovery in metal prices that also is boosting the mining industry. The top four industries—job shops, automo- tive, machinery/equipment and aerospace—will account for almost 67 percent of all machine tool spending in 2017. Although spending by companies in the automotive and aerospace industries is projected to fall slightly in 2017, the spending level in both these industries remains relatively strong from a historical perspective. Also, machine tool spending for these industries w o u l d b e e v e n h i g h e r i f j o b s h o p f i g u r e s were added, especially when one considers that approximately 60 percent of job shops do work for the automotive industry and 52 percent do work for the aerospace industry. THE CORRECT MIX OF EQUIPMENT IS CRITICAL The scarcity of skilled labor and the prevalence of competition from around the world are putting a lot of pressure on U.S. metalcutting facilities. More than ever, the right mix of the latest equip- m e n t i s n e c e s s a r y t o r e m a i n c o m p e t i t i v e and profitable. This is not at all surprising. 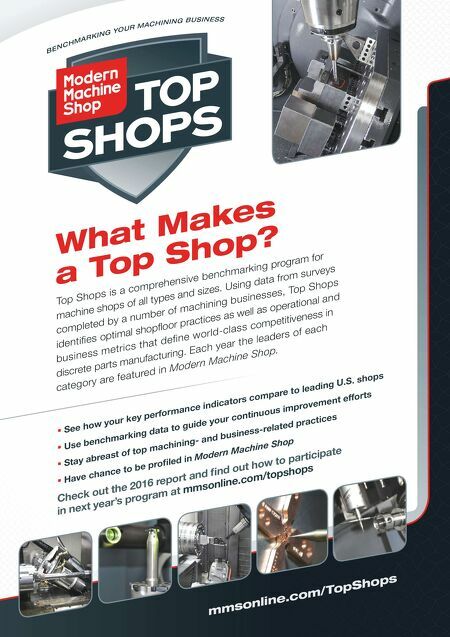 To reference our Top Shops benchmarking survey once more, the most recent results show that the best metalcut ting facilities are making a greater investment in four- and five-axis machine tools, as well as the latest workholding and cut- ting tool technologies, than lower-per forming shops. Clearly, it's the right mix of the latest machining technology that will provide the great- est boost to the level of productivity gains shops are seeking. LEARN MORE mmsonline.com Gardner Business Intelligence, at gardnerweb.com, produces the Capital Spending Survey, World Machine Tool Survey and Gardner Business Index. In addition to these reports, Gardner Business Intelligence offers forecasting, consulting, benchmarking, modeling, and custom research for durable goods manufacturing.